We call it the iPhone Saga, how Apple has perfected the art of juggling the global supply chain, its nose locked on where on earth to get suppliers that can offer the most efficient and best value parts under Apple’s strict quality benchmark. This infographic comes on the heels of our editorial team’s past effort to follow the iPhone supply chain and what it means to American manufacturing. The latest story is about the iPhone 6 using glass and not the rumored sapphire crystal. But the story is more than just the material; it’s whether the cover would be made in America or elsewhere. When GT Advanced, the supplier of TouchID’s sapphire crystal, bumped up its facilities in Mesa, AZ, rumor had it that the iPhone 6 would feature a Made-in-the-USA sapphire crystal cover. It turned out iPhone 6 is still in glass, and it’s likely by Corning, which outsources its fabrication to Asia and France. It appears that Apple is giving out top secrets and arming our biggest enemies with state-of-the-art technologies that can diminish our competitiveness. Foxconn, Apple’s biggest supplier, which assembles the iPhones mostly in its facilities in China, has installed robots (nicknamed Foxbots) for the first time to meet its iPhone production quotas. How ever can this company invest in advanced robotics if not for the humongous Apple orders? But, there’s the rub. It’s rumored Apple is exploring ways to scale down costs by trying robots over Chinese workers. If that sounds familiar, it’s because we’ve seen that before. Our fathers still remember how Japanese robotics booted out many jobs in the American automotive industry. Yes, the China factory is maturing (higher wages and increasing competition from other Asian countries) and it’s inching closer to an American model. I don’t know how things will turn out in the next five years, but that it won’t stay long as it is — America outsources, China receiveth. Who knows, China might one day, under pressure to cut costs, outsource jobs to, well, us? Author: Alex Hillsberg financesonline, an independent journalist specializing in topics about technology, B2B & SaaS solutions and finance in general. 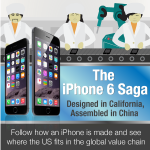 The iPhone Saga “Designed in California, Assembled in China” Follow how an iPhone is made and see where the US fits in the global value chain Apple Around the World Location and no. of Apple suppliers per country China	349 Japan	139 USA 60 Taiwan 42 South Korea	32 Malaysia 29 Philippines 24 Thailand 21 Singapore 17 Germany 13 Vietnam 11 Mexico 7 Indonesia 6 Israel	6 France 5 Czech Republic 5 Belgium 3 Italy 3 Ireland 3 UK 3 Brazil 2 Costa Rica 2 Austria 2 Netherlands	2 Canada 1 Portugal 1 Spain 1 Morocco 1 Puerto Rico 1 Malta	1 Hungary 1 (as of 2014) $4 Extra cost if iPhones are assembled in the U.S. Apple’s manufacturing strategy is motivated by scalability and supply chain risk rather than cost $600M Additional labor cost for reshoring iPhone production in the US 35% Tax on profits Apple would have to pay for US-made iPhones vs. 2% on overseas profits “If Apple brought iPhone manufacturing to the US it would cost them $4.2 B” - Tim Worstall, FORBES Apple’s global workforce at a glance Hit hard by issues surrounding its Chinese manufacturing partners, Apple has implemented a Supplier Responsibility program. 451 - Audits performed in Apple’s supply chain (51% increase since 2012) 1.5 M - Workers participated in labor rights training 60 - Maximum weekly work hours allowed 1M - Number of workers whose weekly overtime hours are tracked 280,000 - Workers that received self-improvement training Designed in the USA US operations still figure much in the iPhone business The Apple Supply Chain Design & Development - USA Sourcing - USA, China, Asia, Europe Manufacturing - China Warehousing - USA Distribution - USA, Global US Jobs Created or Supported by Apple (as of 2014) Full-time employees: 50,250 8.4% Apple supply chain: 257,000 42.9% iOS app economy: 291,250 48.7% iPhone 6 Boosts US Production GT Advanced Technology (Mesa, AZ) Product: sapphire crystal components Has ordered additional 420 sapphire crystal furnace units to bump up production by 84 to 94 million screen covers Samsung (Austin, TX) Product: A series chips Despite strong competition from TSMC of Taiwan, Samsung is said to be manufacturing A8 in its US plant for iPhone 6S on top of its A9 plan GlobalFoundries (Malta, NY) Product: A series chips The company is Samsung’s partner to produce A chips possibly for iPhone 6S in 2015, expanding its Fab 8 facility in its New York plant. Companies that Ramped up US Operations for recent iPhones Avago Technologies (Fort Collins, CO) Product:RF chips Expanded its US capacity with $130 million worth of equipment Texas Instruments (Richardson, TX) Product: chips Ramped up production at its chip facilities, including in Richardson. Fairchild Semiconductor (San Jose, CA) Product: chips Wafer plants in the US operating at full capacity Maxim Integrated (San Jose, CA) Product: chips Started last year a multi-year investment in its American facilities. Corning out? Corning (Harrodsburg KY), makers of Gorilla Glass for Apple devices including previous iPhones, bashed sapphire as 10x more expensive and 1.8 times heavier. Initially rumored to feature a sapphire crystal cover, iPhone 6 still uses glass but Apple isn’t confirming who’s the supplier. iOS 8, biggest iOS release ever Touted the world’s most advanced mobile operating system, iOS 8 is developed by the Cupertino team. It’s the first iOS without long-time Apple designer Greg Christie who had a falling out with fellow designer Jony Ive last year over iOS 7. Made in Asia TSMC is top chipmaker but may be ditched too soon For the first time, Samsung is not supplying the A chip to iPhone. TSMC (Taiwan) is lead supplier of A8 for iPhone 6. But Samsung may be back too soon for TSMC, supplying A8 for iPhone 6S and A9 for future iPhones. Major Asian companies get iPhone 6 job orders LG Display (South Korea) The largest display panel supplier for iPhone 6 Japan Display (Japan) and Innolux (Taiwan) Also has major orders for iPhone 6 screens Sony (Japan) Supplies both front and rear cameras TDK (Japan) - major Apple supplier for inductor coils Toshiba (Japan) and SK Hynix (South Korea) to supply storage at 16GB, 64GB, and 128GB TSMC (Taiwan) to supply Touch ID sensor for iPhone 6; the fingerprint technology debuted in iPhone 5S Catcher Technology (Taiwan) needs to catch up The chassis supplier is fixing glitches in its casing, which may take 2-3 months; meanwhile, Apple switched to Jabil and Foxconn to meet the launching date Asian economies get boost from iPhone 6 The iPhone 6 rollout has created a ripple effect in the economies of Japan and Taiwan, which supply microprocessors, camera lenses, and display for iPhone 6 5% Increase in Japanese electronics exports $1.17B Japanese machine tools ordered by China for iPhone 6 assembly 8.6% Increase in Taiwanese electronics exports $26.9B Projected revenue for Taiwanese suppliers of iPhone 6 Fabless US and Asian Suppliers also Outsource to Asia Many US-based suppliers also subcontract iPhone component orders to companies in Japan, Taiwan, and South Korea, which outsource fabrication to other Asian countries with cheaper labor or greater ability to scale up production. That's how everything ends up being "Made in China." Singapore, Malaysia, Thailand, and the Philippines get a lot of the action, too, mostly as suppliers for back-end components. Provided by Europe, No More? French-Italian STMicroeletronics provided the gyroscope in past iPhones, but may lose it to InvenSense, the San Jose, CA-based company NFC finally in iPhone 6 Dutch company NXP is said to be supplying the short-range wireless chip for iPhone 6 that connects the phone to pay terminals and future Internet of Things uses Assembled in China Foxconn and Pegatron in 50/50 split over 50M iPhone to be shipped by end of 2014 Brazil gets into the assembly action Where iPhone 6 is assembled Foxconn (Guangdong, China) Foxconn (Henan, China) Foxconn (Shanxi, China) Pegatron (Shanghai, China) Foxconn (Sao Paulo, Brazil) US lacks labor capacity to ramp up production Period to hire 8,700 engineers to manage 200,000 factory workers US: 09 months China: 15 days Biscuit and Tea In 2007 Steve Jobs decided that he wanted a glass screen for the iPhone a few weeks before launching. American suppliers said the deadline was impossible. In China, a factory constructed a dormitory even before signing a contract so its employees could work 12-hour shifts. When the deal was sealed, 8,000 workers were roused from sleep, given biscuit and tea, and they started fitting glass screens into the iPhone to product 10,000 iPhones a day. 130,000 Employees - additional workforce in Foxconn and Pegatron facilities to work on iPhone 6 10,000 “Foxbots” - robots deployed by Foxconn to assemble iPhone 6. Each robot can assemble 30,000 devices. Is the iPhone Supply Chain Model Now the the Norm for American Manufacturers? I wouldn’t say those Foxbots would replace Chinese workers, who manually pack the iPhones. They’re probably assigned to more specialized tasks like circuitry or micro-welding, where precision workmanship is required. In fact, with these robots Foxconn only gets more competitive and attractive as a manufacturing base to China’s delight. Nice work on the graphics; it’s easier to get the big picture. Hey Alex, I was browsing through your cool layout to check which supplier should get the ax for the bending iPhone casing. I couldn’t pinpoint the culprit though, but definitely not Foxconn or Pegatron because these guys are just putting all parts together. Any idea which is behind the bend issue?